If your browser doesn’t redirect you to the new location, please visit The Outdoorlife Blogs at its new location: www.outdoorlife.com/blogs. 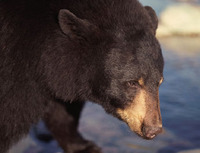 A ranch hand in Colorado was sucker-punched by a black bear after he left an outhouse. While the man was answering the call of nature, the black bear made a meal of his lunch. When the ranch hand stepped out, he walked right into an angry bear. One punch from the bear and the ranch hand was knocked more than 10 feet. He made it to his car, but the bear was on his tail. The bear then chewed on the car’s tires and sniffed around the windows. The ranch hand must not have felt too threatened because he reportedly took pictures with his cell phone before leaving the area. Hand crafted AKM stock sets. You will be the next outcast like Jim Zumbo - sad but true. Let facism ring.